I think I've mentioned before that I'm kind of old. 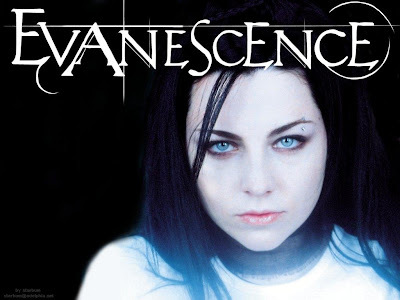 Proof of that is that I just discovered a wonderful band/singer, called Evanescence (the band's name) and two of their songs which resonated with my current existence a bit. What little concept I had of Evanescence was that is was ala Marilyn Manson, sort of a satan worshipping thing. I have no idea why I thought that. Maybe I saw a photo of the lead singer and she is sort of goth-ish. So I was shocked when I was at Mango Tango with The Bug having yogurt the other day and I was enchanted with the song MY IMMORTAL that was playing on the muzak (what do they call that these days?). The teenage staff person told me and I was amazed. This word, evanescence, what does it mean? I just looked it up. What a beautiful word. To dissipate or disappear like vapor. See Synonyms at disappear. Here's the video for the first song, GOOD ENOUGH. Will post on their other song, MY IMMORTAL in a future blog. This video is rather interesting. I abhor the burning of books, or even the thought, but I don't think that this video is intended to mean what this act of hatred usually means. I was also attracted to the use of so many beautiful books in this video, even though they are eventually burned. This video is about redemption somehow, no? What do you think about the song, the video and the word evanescence.